We believe that when our students participate together with their families in learning experiences, worship and communal holiday celebrations, they get more out of them, make more friends and simply have more fun. 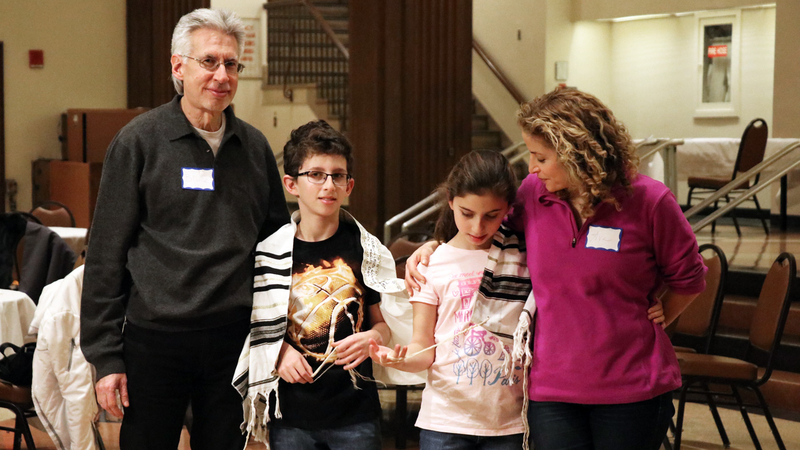 In all our programs, we create an environment in which families can explore Judaism together while forging strong connections to the Emanu-El community. And for families with children preparing to become a bar or bat mitzvah, we offer a series of “mini-retreats” in the three years leading up to this life-cycle event. There are many opportunities each and every month to learn, volunteer, worship and socialize with other families. Questions, comments or ideas for something families would like to see happen here at Emanu-El should be sent to Jackie Schreiber, Program Director of Faculty & Family Engagement). Our Religious School has a long history of active parent participation and dedication. The Parents Association Steering Committee works in close participation with our clergy and the staff of the Department of Lifelong Learning to set the agenda and establish the priorities for innovation and change in our school-age programs. These volunteers provide a means by which all parents may voice suggestions and concerns about our programs. Their primary concern is to build community among the families of the school and the synagogue. To get involved, please contact the school and we will put you in touch with the Parents Association. There are so many events that go on in the Religious School and temple overall, we often need a few extra hands. Not only can volunteering result in much-needed help to the temple, but it can also strengthen a family’s connection to the Emanu-El community. Parents interested in learning about the many opportunities to volunteer in the school and beyond (preparing mailings, assembling holiday gifts, running a booth at the Purim Carnival, helping with registration, chairing an event, working in the library, ushering during High Holy Days, Mitzvah Day projects and more!) should contact Rachel Brumberg. All are welcome at this inspirational and uplifting prayer service, which is led by our clergy, Religious School Director Saul Kaiserman, and members of our Religious School faculty. Shabbat Kodesh provides a stirring opportunity for families to connect through worship and builds upon the values and curriculum offered at the Religious School. Relatives and friends are welcome. We also welcome prospective families interested in applying to our school. Services are always followed by a family dinner. Click here for more on Shabbat Kodesh. Throughout the school year we hold Shabbat dinners open to temple families and their guests. These dinners provide an opportunity for our community to meet and socialize. Dinners are appropriate for all age groups, and age-appropriate activities for the students (such as mitzvah projects, art activities, storytelling, and games) are offered at each dinner. The fee per family (up to two adults and any number of children) is $45 before the deadline and $65 after the deadline. Teens (eighth through 12th graders), if unaccompanied by an adult: $15 each. Additional Adults: $18 each. Check the calendar our next Family Dinner. Temple Emanu-El periodically organizes a trip to Israel that is designed to be equally appropriate for adults and kids, family and friends. We explore Israel from the Negev Desert to the Golan Heights, from Jerusalem to Tel Aviv, and everywhere in-between. Take a look at our Israel Trip page for more information.